LAWRENCE, KS—Liberty Hall in Lawrence, KS is rich with history in this culturally diverse college town. Originally built in the 1850s, the theater has suffered two destructive fires. Purchased auction in 1985 by current owners, David and Susan Millstein, the space has been resurrected a third time and totally renovated. A NEXO GEO S 12 Series was chosen for its coverage, high output, and low visual impact. products tested, a NEXO GEO S 12 Series was the choice based on excellent coverage, high output, and low visual impact. A Yamaha M7CL-48 was installed for its wide acceptance by touring bands and to keep the FOH footprint to a minimum, since the equipment is often struck to allow for movies, meetings, and receptions. A ProCo 40-channel splitter snake handles the stage and FOH connections. Fitzgerald talked with several touring clients and they were all favorable towards the NEXO and Yamaha combination. "I knew we would have a rider-friendly rig, and since it has been installed, engineers have all been very pleased with the system," Fitzgerald said. Eight Nexo S1210 with two S1230 were flown with four S2 subwoofers ground stacked. Two Nexo NX242- ES4 with EtherSound handle the speaker processing. 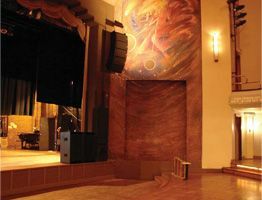 "In old theatres, space is always an issue, so the four Yamaha T5n amps and processing are in a rack that is flown about eight feet off the ground downstage right to preserve stage space. This is our second GEO S12 installation, which I really like, and the S2 subwoofers are so powerful, they will just about knock you over," Clasen said. Two PS15 speakers are flown for center channel movie reproduction. A Dolby cinema processor was installed that feeds an Ashly Protea Matrix processor which handles preset routing for the movies as well as concert settings with a preset for aux feed subs or fed from L/R buss. "One of the main challenges was to install a system capable of reproducing the movie sound and at a push of a button be able to be a rock concert sound system," Clasen noted. A preset was also installed for aux-fed subs if the band engineer prefers. Kansas Public Radio production manager Jason Slote mixed FOH for Liberty Hall's inaugural show, a Waitiki concert. "I've mixed a lot of shows here in the past and I was always fighting the room or feedback, and with a stacked sound system, balcony coverage was an issue. The NEXO system takes care of all those issues," Slote said. "I was amazed at the clarity and gain of the system without a hint of feedback." Recording live radio shows in the space also impressed Slote: "This is a very easy system to mix on and very powerful." "We are very pleased with our choice to use MSM Systems, and their professional approach and expertise made our investment pay off with happy customers," stated owner Susan Millstein. MSM Systems has extensive experience with NEXO and Yamaha products. "We have always gotten good results and support from Yamaha, and NEXO and Yamaha products are a great package," Clasen said. "There are many challenges working in a 100- year-old venue, but our crew did a great job of installation and working with the helpful Liberty Hall staff. It was a combined effort."